First published in 1613, the 367 copperplate engravings by Basilius Besler (1561-1629) capture the spectacular diversity of the palatial gardens of Prince-Bishop Johann Konrad von Gemmingen (1593/95-1612) in Eichstatt, Bavaria, Germany. The meticulous illustrations are organized according to the four seasons, and, following the classification system used today, show plants belonging to a total of 90 families and covering 340 genera. The whole collection is regarded as one of the finest treasures of botanical literature; it was described by Carl Linnaeus, the legendary 18th-century botanist and zoologist, as an "incomparable work." Besler's pictorial catalog long outlived the gardens, which were destroyed in 1634 by invading Swedish troops. 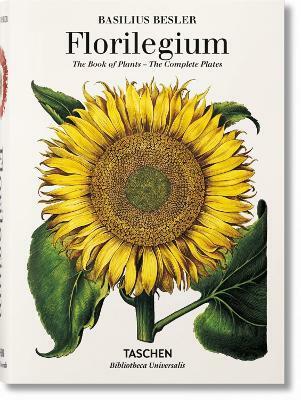 In auction, the asking price for a first-edition copy of Hortus Eystettensis is now more than half a million dollars. With this edition, TASCHEN opens up the garden to a much wider audience: a rich and beautiful record, destined to keep the garden's beauty in bloom. "Given the scholarship and quality of the reproductions, this book is a bargain." Klaus Walter Littger is head of the manuscript department at Eichstatt University Library. In addition to essays on German language and literature, he has published a number of papers on the history of the University of Eichstatt and the history of music at Eichstatt. He is editor of a periodical and a series of publications on the history of Eichstatt. Werner Dressendorfer is a pharmaceutical historian and academic librarian. He taught at the University of Erlangen-Nuremberg, where he was an honorary professor. His particular spheres of interest are the history of the Early Modern herbal, the cultural history of useful and medicinal plants, and plant symbolism in art. He has published extensively on pharmaceutical and botanical history. He is the author of TASCHEN's The Garden at Eichstatt, The Lilies, Leonhart Fuchs: The New Herbal of 1543, Pomona Britannica, The Temple of Flora and The Vegetable Garden.